Far up at the summit of the mighty peaks the heat of the noon-day sun was turning the deep banks of snow into a network of little rivers, all of which seemed to converge with singular unanimity toward the spot away down the ravine where the railroad men were laboring like beavers in a desper­ate effort to strengthen the trestle. 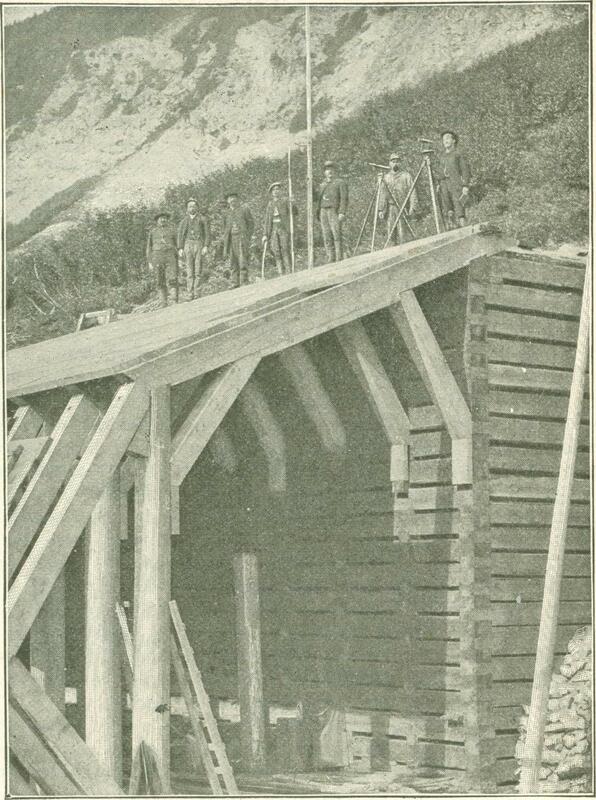 There were men felling trees and men dragging great logs, men building trestles and braces and wooden bulwarks. There were men laboring to the utmost of their physical powers, and there were men direct­ing their labors. And one man there was, sturdy, plainly dressed and calm of bearing, who directed the directors. He seemed to be everywhere, giving his personal attention to each detail of the work. He found the spots claiming immediate attention, and measured accurately with his eyes the speed of the rising waters. He superintended the unloading of rock brought by puffing engines, and assisted with his own hands in placing the heavy blocks of stone. He told the carpenters how to secure the huge wooden braces, the smiths where to fasten their iron clamps, and with it all never lost for one moment his cool, authori­tative demeanor. All through the day he drove the men and drove himself, and when the light of the fading sun vanished beyond the western peaks, he saw that the bridge was saved. The Chinese laborers and the Siwash con­struction hands limped slowly to their little camp built here and there in the crevices, and along the ledge wrought for the tracks. As the shadows darkened into night, the general manager made a final tour of inspec­tion, and withdrew, soiled and worn, to his car. A few moments later the groups of tired men huddled about the camp-fire heard a strain of music mingling with the voice of the torrent, and the sough of the winds in the pines. They exchanged wondering glances, and asked one another the cause of the unexpected melody. They got up to find out. Presently the Siwash and the Chinese, the foremen and the skilled mechanics were standing at a respectable distance from the private car, gazing wonderingly through a window at a toil-stained man seated just within. Tucked under the bearded chin was a violin; a bow, grasped tenderly by a hand still bearing the stain of work, passed slowly across the strings. An aria from Gounod floated out into the night. "Say, fellows, it's Van Horne himself," commented one of a trio of engineers in the group surrounding the car. "Yes, and it's a sign that he's satisfied with the day's work," replied another. "The old man plays that trembly sort of a piece when he's pleased, and he plays it like he works, and like he paints pictures, and like he man­ages men—a little better than anyone else on this here earth." In February, 1843, a boy was born in the Van Hone family, then living in a small cross-roads settlement called Chelsea, four­teen miles from Chicago. The farmer was a lawyer of some local repute, but failing for­tune compelled his son William to enter the service of a farmer at an early age. William hoed potatoes and curried horses, but, unlike the subjects of the ordinary biography, he did both very badly indeed. He was a lad to dream, and to see visions of future greatness. He read every book obtainable, and drew crude maps of engines and of ships. One day he took up the study of telegraphy. It was an inspiration, one of those trifling acts in a man's career which sometimes forms the turning point in his career. "He learned to fiddle a little and drum a piano, and, having a talent for drawing, he began to cultivate art. He once drew a caricature of General McClellan on the brown painted side of his telegraph station on the Illinois Central, which came near costing him his place. The picture represented General McClellan in full regimentals, but in a dangerously undignified attitude." This was but the exuberance of the boy; he had not seen then the scope of the world or realized what it had in store for him. The position of operator was the first step in a railway career destined to prove re­markable. It was the first round in a ladder of uninterrupted success, a ladder covering the gamut of railroad positions, and ending in the absolute control of the Canadian Pacific, the greatest railway system on earth, and in a British knighthood. William Van Horne's earlier years after his operator's experience were spent in and about Chicago. He filled scores of positions, each better than the other until about 1879, when he was appointed general superintendent of the Chicago, Milwaukee and St. Paul. His big brain, his intense personality, his tremendous energy, and his ready grasp of every railway problem made him even then a conspicuous figure among railway men. It probably would have been better for the American roads if William Van Horne had remained on this side of the line. Certain it is that he could not but have added to the progress of any undertaking with which he might have been connected. It was not to be, however. That same hand of fate which had lifted him from the farm to the telegraph office, and from the telegraph office through various stages to the superintendency of an important road, was about to carry him into another country, and to a work destined to form one of the most conspicuous chapters in the world's railway history. While William Van Horne was overseeing the welfare of the St. Paul road, events of future importance to him were unfolding north of the boundary line between Canada and the United States. It is a common remark up there to-day that Sir William Van Horne is the Canadian Pacific and the Canadian Pacific is Canada. Yet when the wonderful railway was first projected, Sir William had not been thought of in its connection. A railway from the Atlantic to the Pacific, all the way on British soil, had been the subject of discussion and planning for almost half a century. In 1867, on the confederation of the British North American Prov­inces, its realization was found to be a polit­ical necessity. With the newly formed union came a renewed envy, if it might be so termed, of the prosperity of its southern neighbor, the United States; and there was an almost unanimous belief that a trans-con­tinental railroad was necessary to the well­being and the growth of the country. In 1875 the government of the new Do­minion of Canada set about the building of the Canadian Pacific, a task of such vast moment that the richest empire of Europe might well have hesitated before entering upon it. Previous railroad construction had been child's play compared with this project which proposed venturing with bands of steel into regions hitherto unexplored, and lying in a country certain to offer formidable obstacles. Toward the east, all about Lake Superior and beyond to Red River, was a vast rocky region, where nature in her younger days had run riot, and where deep lakes and mighty rivers in every direction opposed the progress of the engineers. Be­yond Red River for a thousand miles stretched a great plain, known only to the wild Indian and the fur trader; then came the mountains, the imperturbable ranges of rock, which lay like a Cyclopean wall be­tween the plains and the distant Pacific,. Through all this, for a distance of nearly three thousand miles, the railway surveys had first to be made, and that before a pick could be placed into the ground or a rail laid. The surveys were commenced in due time, but it was not until 1875 that the actual work of construction began. It is a well understood fact that the ma­chinery of the government under any circumstances is ill-adapted to the carrying-on of such an enterprise, and it was so in connection with the new railroad through Can­ada. Governments changed, new parties came into power and a multitude of delays oc­curred, until finally five years had passed without material progress in the work. The history of these five years would make interesting reading, giving, as it would, an insight into the strenuous efforts of three administrations to complete a project so dear to the Canadian heart and so important to the future of Canada, but the limits of a magazine article render such a description impos­sible. 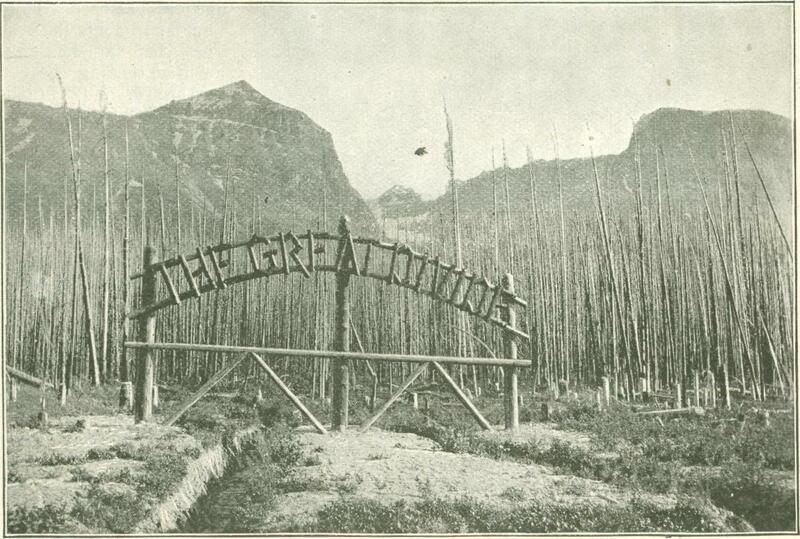 It is enough to say that by 1880 the subject of t h e building of the Canadian Pacific had en­grossed a whole nation. Ministries had risen and been humbled to the dust again, the press had made it the paramount subject of discussion, cities and hamlets had voted upon it, and the citizens in the streets and in the country lanes had it ever upon their tongues. Finally, in what seemed a very spirit of despera­tion, it was decided by common consent to sur­render the work to a private company. In 1879 a small syndicate of Canadians and Americans had purchased the rights and franchises of the St. Paul and Pacific Railroad. They had at once set about extending the road northward, and were do­ing such excellent work that when it came to a question of selecting a private company to com­plete the C. P. R. the government turned to this syndicate. A contract was entered into with its members, with some others added, to construct the Canadian Pacific Railway. By the terms of the contract the syndicate undertook to form a company to build the road from Callander, a town near Lake Nipissing in Ontario, to the Pacific, and afterwards to operate it, for a consideration of $25,000,000 and twenty-five million acres of land in the "Fertile Belt," with the right of way through public lands, and the necessary ground for stations, docks and wharves. In addi­tion to this those sections of the road built by the government were to be handed over to the new company. On the ratifica­tion of the agreement for the construction of the transcontinental road, the syndicate formed a company, the original capital of which was $5,000,000 at par. On the forma­tion of the company, work was at once com­menced on the road. The explorations and surveys for the railway had made known the character of the country to be traversed. 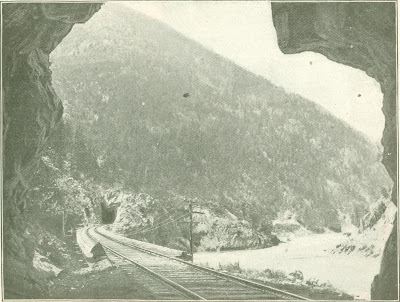 The railway system of Eastern Canada had already ad­vanced far up the Ottawa Valley, attracted mainly by the rapidly growing traffic from the pine forests, and it was from a point almost in connection with this system that the new Canadian Pacific Rail­way was to be carried to the Pacific Coast, a dis­tance of 2,550 miles. One section of 425 miles be­tween Lake Superior and Winnipeg, and another of 213 miles from Burrard Inlet, on the Pacific Coast, eastward to Kamloops Lake, in British Columbia, were already under con­struction by the govern­ment. This left 1,920 miles to be completed. On the 15th of Feb­ruary, 1881, the first sod of the new Canadian Paci­fic Railway was turned, and before the end of the year 163 miles had been built on the prairie west­ward from Winnipeg. By this time, however, the directors and their financial agents in Europe had found that there were difficulties in the way of raising the requisite money. Opposition, secret and open, both at home and abroad, created a distrust of the undertaking, so that the managers of the charter were in the posi­tion of having a work on hand in which delay meant heavy loss and possible com­plications with 'the government, while the money necessary to proceed with due speed was not forthcoming. Moreover, money was wanted for perfecting necessary con­nections. It had already become clear to those responsible for the success of the enterprise that the road could not be left with its Eastern terminus in the wilderness, de­pendent on communications provided by other people, and without sufficient Eastern con­nections for originating and transferring business. Fully realizing this, the company made an effort and secured sufficient money with which to purchase several small roads and to lease others. Following this move came a little reaction, but the horizon of the gigantic enterprise soon became over­clouded once more. It was at this time that attention was called by the enemies of the road to the contract made with the government provid­ing for the completion of the uninterrupted line within ten years. They declared this was impossible, as the formidable obstacles found along the north shore of Lake Superior could not be overcome in twice the stipu­lated length of time, and furthermore that the north shore section would never be built because, they felt assured, other routes would in the meantime have come into being, rendering the construction around Lake Superior unnecessary. There was inde­cision and hesitancy, delay and bickering, and then a man stepped into the breach. A month or two earlier a new incumbent had been secured for the position of general manager of the road. 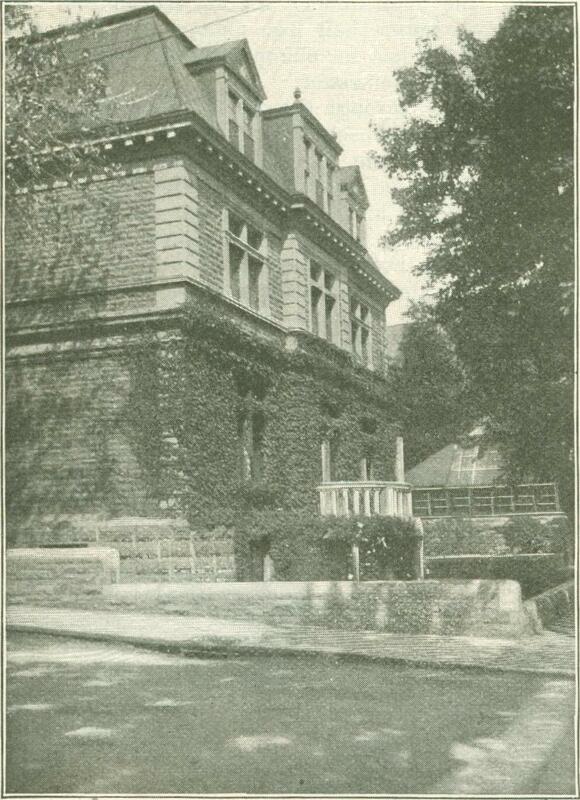 The need for a practi­cal railroad man had caused the projectors of the company to look about them, and they finally offered the position to the then superintendent of the Chicago, Milwaukee and St. Paul Railway—William Cornelius Van Horne. This was an important step, as it really meant failure or success to the company. The compliment thus paid to the American railway man who, starting in life on a farm, had worked his way up to a position high in railway circles, cannot be overestimated. It practically meant saying to this son of Illi­nois, this foreigner, "Here, we have reached our last ditch. Our future depends upon you. Now save us if you can." Students of latter-day Canadian history like to dwell upon this part of the Canadian Pacific's story. To them it means an epic of individual prowess, the warfare of a strong man—strong mentally and physically —against almost insurmountable obstacles. 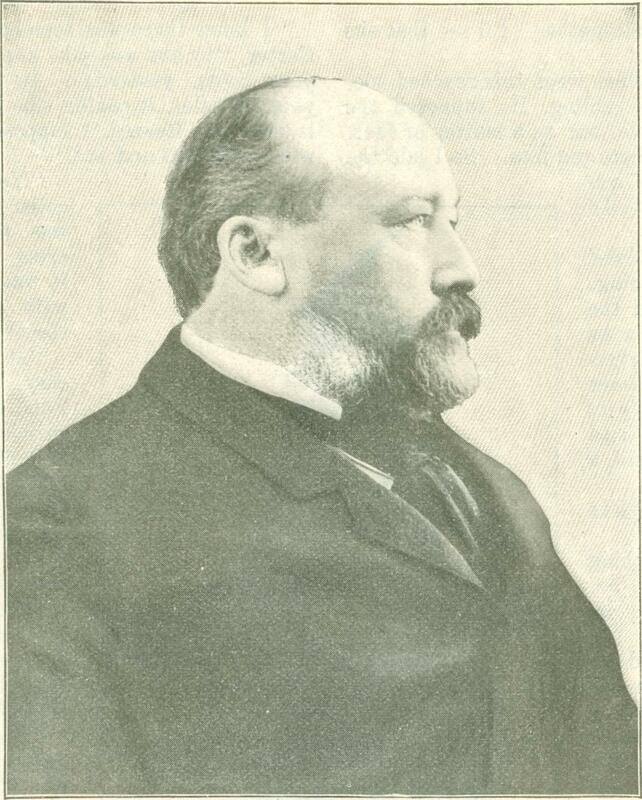 Within six weeks of his appointment William Van Horne made his presence felt. When the enemies of the road began to decry the building of the north shore section —that along the upper end of Lake Superior —Van Horne promptly advocated the reten­tion of the original plan, and insisted that an all-Canadian line was absolutely neces­sary. His opinions, backed by the extra­ordinary influence he had already commenced to exercise over his associates, were ac­cepted, and he plunged into the work with all the strength of his iron nature. His first task was to attack the wilderness on the north of Lake Superior. Twelve thousand railroad navvies, and from 1,500 to 2,000 teams of horses were set to work, involving the use of a dozen steamers for the transport of material and provisions. It was a small army in number, but its motive, creation instead of extinc­tion, made its work of wonderful interest. The problem boldly faced by the new gen­eral manager was one calculated to daunt the most venturesome and daring spirit. In his preliminary and personal survey he had found what he afterward characterized as "200 miles of engineering impossibilities." The country it was necessary to cross was a waste of forest, rock and muskeg (bog), out of which almost every mile of road was hewn, blasted, or filled up, and in places the filling-up of muskegs proved to be a most diffi­cult task. There were moments during the work when even William Van Horne's stout heart almost failed him. Discouraging reports from surveyors and en­gineers, the discovery of unexpected obstacles, and the varied phases of weather, rain following cold and floods following rain, made the task hard beyond the comprehension of ordinary men. But there was that in the old Dutch stock of the Van Hornes, and perchance, in the American spirit of the Illinois-born man, which caused him to ham­mer away at the problem until he finally succeeded. It is well to say in passing, that if William Van Horne had accomplished nothing else, his victory over the engineering difficulties afforded by the line along Lake Superior's north shore would give him fame enough for one man. While the work of constructing the Lake Superior north coast line was progressing other portions of the great systems were receiving the attention of the tireless gen­eral manager and his assistants. The Rocky Mountains, that formidable barrier of in­terminable snow peaks, had to be pierced. 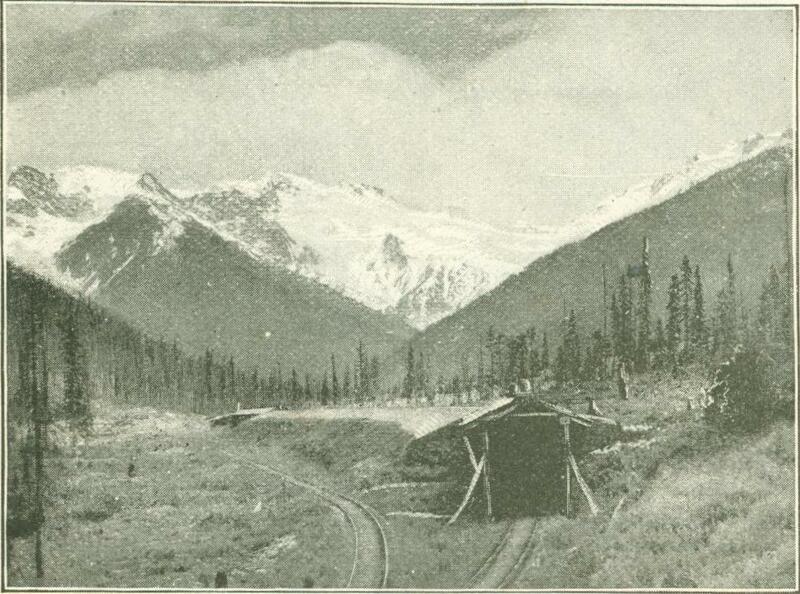 To those who have traveled over the Cana­dian Pacific from Mon­treal to Vancouver the feat of building even a single track railroad un­der such conditions and through such a marvelous country is almost past understanding. The ob­stacles presented along the north shore fade into insignificance when com­pared with those encoun­tered after entering the majestic Rockies. Every conceivable engineering problem was encountered and overcome. Trestles, bridges, cuts and fills without number were em­ployed, and to achieve all this money was spent with a liberal hand. It was like campaigning in a hostile country. To rout the forces of nature called for a vast army of men, and this army re­quired a commissary corps as efficient as one accom­panying a military body. Pick and shovel, dynamite and blasting powder, formed the weapons of offense; temporary rails and engines the transpor­tation; great hordes of Chinese and In­dians the rank and file; intrepid and skill­ful Canadian, English and American en­gineers the staff, and at the head of it all, the general-in-chief, was William Van Horne, the Illinois boy who, twenty years before, had started in his railroad career as a cub telegraph operator. To appreciate the stupendous task accom­plished by these hardy men in the Canadian Rockies requires a personal visit to the scene. Mere word pictures are powerless to portray adequately the manner in which they fought and conquered the thousand and one obstacles daily encountered by them. Prac­tically every foot of the mountain division of the road was contested, and probably every mile of tunnel and track was sealed with the blood of man. The bridging of fathomless chasms and the piercing of many mountains were accomplished only after herculean labor and much suffering physically. There are bridges on this mountain division that hang in air—mere spider webs of iron—three hundred and odd feet above the river they span. There are places where old masonry is plas­tered, so to speak, against the solid rock of mountains. There are ledges midway be­tween heaven and earth, and elevations where the whirling trains plunge headlong into clouds, and deep, cool ravines where the roadbed disputes with the darkness the realm of mysterious mountain torrents. There are miles of tunnels and bridges without number. On the mountain division alone the exigencies of the winter season compelled the construction company to build thirty-two miles of snow shed, and that at the enormous cost of $64 a lineal foot. Over ten millions of dollars expended as a pre­liminary precaution against snow! Small wonder that Her Majesty, Queen Victoria, honored the man who faced all these problems and was daring enough to undertake such a colossal task, with a knighthood of the distinguished order of St. Michael and St. George! 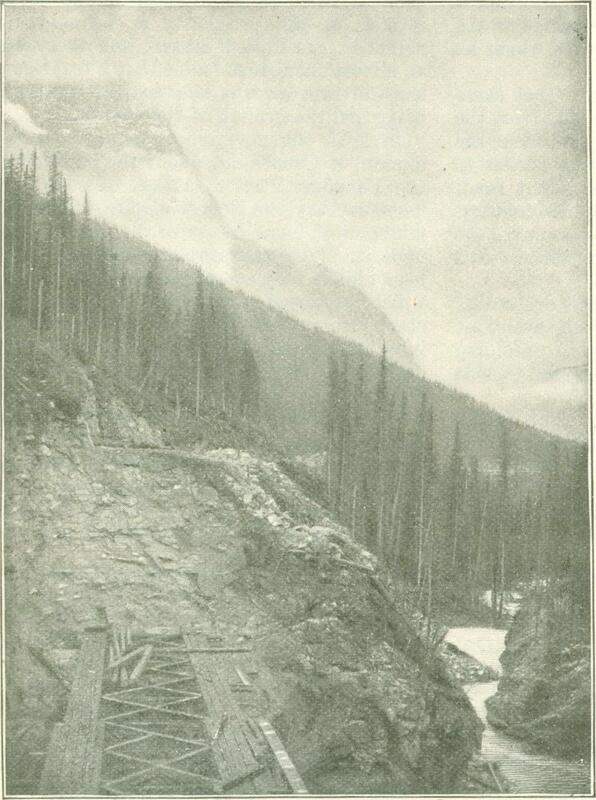 While the mountain division was being carried through, the government's contrac­tors had finished certain other portions of the road, enabling the company of which William Van Horne was general manager, to take possession in conformity with the terms of the contract, and to connect the Pacific portion of the line with that coming from the East. 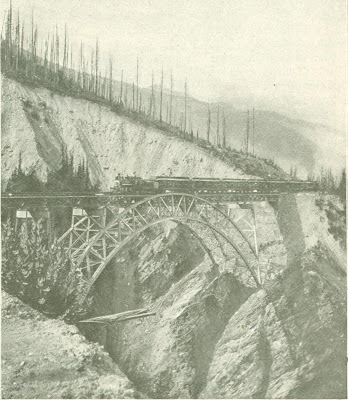 Finally, one rainy day, the 7th of Novem­ber, 1885, a party of men assembled in the modest settlement of Craigellachie, a short distance west of the Columbia River, and one of the party, Sir Donald A. Smith, drove the last spike of the connecting rail, thus establishing a railway from ocean to ocean within Canadian territory. That picturesque ceremony was of un­bounded interest to the American people for two reasons. 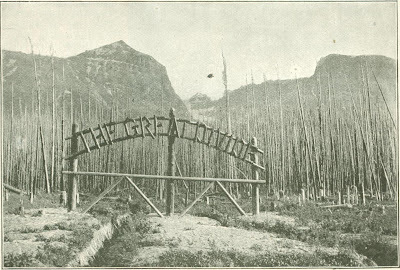 First, because it meant the completion of a railway destined to become a formidable factor in the carrying trade of the North American continent; secondly, because, assisting in the ceremony, was a man of their own kind who with his own brains and with his own hands had added to the list of great human achievements one of enormous and far-reaching propor­tions. In the history of great enterprises the work itself must always take second place. Human interest lies in the man or men who planned and accomplished the work. It has already been said in this article that Sir William Van Horne, to give him his title, could rest his fame solely upon the building of the Canadian-Pacific. But he is more than a general manager, or a president, or a rail­way builder. He has been compared to Cecil Rhodes from the standpoint of marvelous versatility. He is an artist of undoubted ability, and a connoisseur in music. He reads Spanish, Italian and Japanese with facility, and has made an exhaustive study of the art, history and literature of Japan. His interest in the latter country has caused him to undertake an extended history of Japan­ese art which will be published in many vol­umes, illustrated in color by Sir William himself, with sketches of all the exquisite gems in his own collection. In his palatial home in Montreal this pro­duct of Illinois soil has a magnificent collec­tion of paintings, ancient and modern. The Dutch Seventeenth Century school is largely in evidence, while modern French, English and Spanish are represented. In addition to the engrossing cares of a railroad magnate, having under his supervision a gigantic corporation valued at two hundred million dol­lars, Sir William has found time to become a prosperous amateur farmer in two prov­inces, and to cultivate special species of mushrooms. Today he is still comparatively young - only fifty-seven years of age—and from all appearances he has barely com­menced to employ his talents. "If you want anything on that subject see Sir William Van Horne. He is at the head of the largest paper pulp concern in the country." "Better see Sir William Van Horne. He has the largest interests there." "The information, in all probability, can be obtained from Sir William Van Horne. He heads the syndicate."